Plesk first crossed my path when it came packaged with web hosting acquired from a Russian provider. At the time it was version 12.0, but I never paid any attention to it until I discovered that part of its service was domain names registration. It couldn’t hurt to register a couple of domains for myself, and so I did. I added them to Plesk, and configured the DNS records. Now these websites loaded default web pages. Then, as I already had websites hosted in Plesk, I thought “Why not use mailboxes registered on my own domains?”. So I went and created a couple of mailboxes and configured Roundcube webmail. But it was all just personal use until I occasionally started to use this complete infrastructure as a sort of a test server. Why? In order to solve tasks related with questions from forum users. And so, my Plesk server operated like this for a while without any use cases development. That is, until the start of 2017 – when I spontaneously took a closer look at something I had available, but which was laying there unused this whole time. I realized that I could now use my own platform for my personal blog. It didn’t take me long to choose WordPress as I had previous experience with it. What’s more, the new Plesk Onyx had integrated its WordPress Toolkit, which looked promising. After getting a license with additional extensions, I started building – themes, plugins, you name it, before publishing my first posts. Plesk is also built for multiple domains. So when my famous, American Instagrammer friend needed a website to develop her “Travelling with kids” idea, I offered my hosting platform. Within Plesk, I created a personal account for her and subscriptions with two domains. One was used to host her website, and the other to host her personal mail. She quickly learned how to use the WordPress admin dashboard and Plesk. She created mailboxes and installed WordPress plugins and themes. Then created posts and moderated comments. Which I believe says a lot about how easy Plesk’s interface is. As thousands of subscribers were actively visiting both our blogs, it was time to pay more attention to Plesk server maintenance. And later, to server optimization, creating regular work in the Plesk interface and even more in the Linux command line. But more on that later. Before that, there were common issues of all sorts that I had started to face. During an internal contest for the best WordPress website hosted in Plesk, I focused on two goals. I wanted to make my WordPress website the fastest and the most secured. To achieve the A+ note on ssllabs.com, special NGINX parameters became necessary. They were installed via Additional nginx directives and the /etc/nginx/conf.d /ssl.conf file. An attempt to maximize the speed of my website powered by NGINX was a special matter. At that time, NGINX caching wasn’t yet implemented in Plesk. So I tried various caching solutions, such as redis, memcached, and the very same NGINX caching. All via the CLI, of course, but with the help of customized settings. It didn’t take long to realize the NGINX version shipped with Plesk was not suitable to use with trendy acceleration technologies. Ones like caching, the brotli compression method, PageSpeed Module, or TLS1.3. Even the Plesk Forum also raised this issue as it seemed to occupy the minds of advanced users. The result was publishing different ways how to compile the latest NGINX versions. Thus, supporting modern technologies, and substituting the NGINX version shipped with Plesk for a custom one. I also joined forum users in compiling and optimizing NGINX builds for my Plesk server, all during the contest. In the end, I got the speedy WordPress site I wanted powered by customized NGINX with Redis caching. All was well until Plesk Onyx was released. 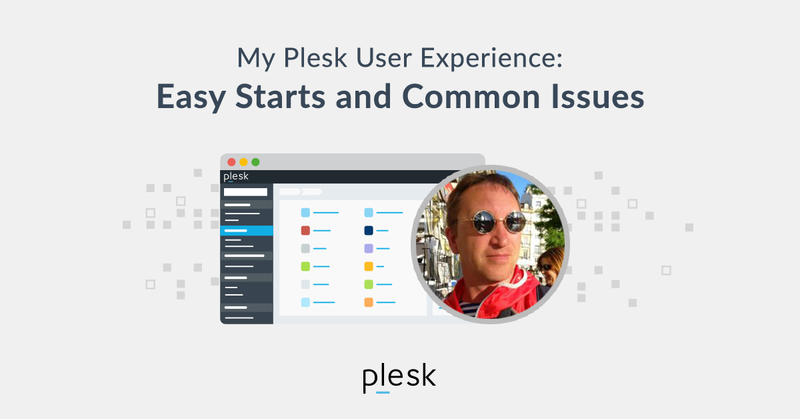 See what happened next in part 2 of my Plesk experience story tomorrow. Plesk is available in Cloud Server Plesk.Contact us to find out our latest offers!